cohealth is one of the largest community health organisations in Australia, servicing a broad area of high-growth communities across Melbourne's northern, western and inner suburbs. Built on the values, reputations and expertise of three respected organisations, cohealth provides quality services across mental health, oral health, family violence, alcohol and other drugs, aged care and medical and integrated health services. Wyndham Best Start in Life Alliance would like to acknowledge and pay our respects to the Traditional Custodians of this land, past and present. 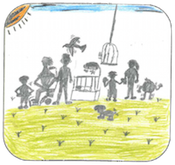 Wyndham Best Start in Life Alliance would like to acknowledge and thank the four students from local schools who have allowed for their drawings to be used on this website. most vulnerable children and families in the City of Wyndham.